On 22 January 2017 at 00:42 hours a shooting occurred in the parking lot of various businesses at Beaver and Urbandale Ave in the City of Des Moines. At the time several businesses were open for business and occupied by patrons. As numerous rounds were fired, Saints Pub and Patio was struck, with at least 3 rifle rounds entering the establishment and damaging property within. Multiple vehicles in an adjacent parking lot where the shooting occurred were also damaged with numerous rounds striking the vehicles. Des Moines Police detectives are asking for the public’s help in identifying suspects in a theft from a pop machine on 6 Jan 17. 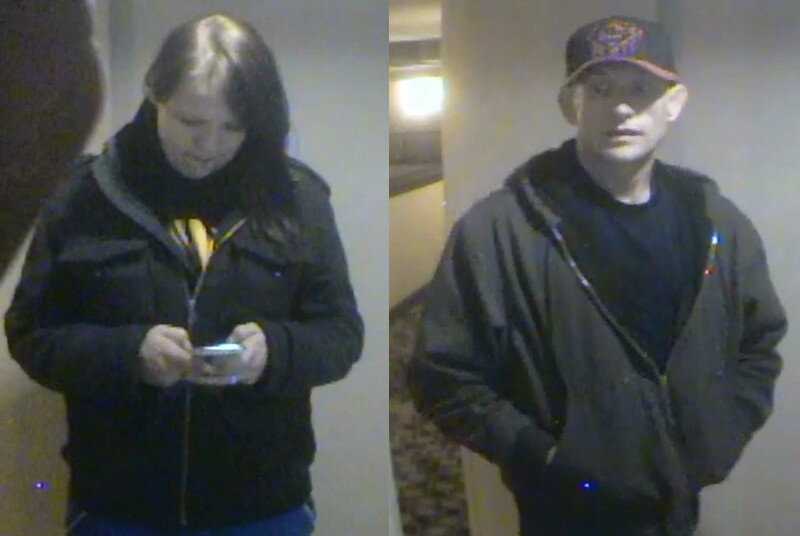 The theft occurred at the Embassy Suites hotel, 101 E Locust in Des Moines. In the video you can see a white male breaking into the machine and removing cash while a white female acts as a look out. Anyone with information is encouraged to contact the Des Moines Police 515-283-4811, or Polk County Crime Stoppers at 515-223-1400 or on the website www.crimestoppersofcentraliowa.com. On December 28, 2016, at 1:53 a.m., the Ames Police Department responded to a report of a shooting at 1419 S. Grand Avenue #403. When officers arrived, they found a male victim with a gunshot wound to his chest. The victim was transported to Mary Greeley Medical Center by ambulance and then transported to Iowa Methodist Medical Center in Des Moines by air ambulance. The victim is in critical condition. The name of the victim is being withheld pending notification of family members. Two individuals who were in the apartment when officers arrived are being questioned by detectives. The individuals initially refused to provide details regarding the shooting. The preliminary investigation leads us to believe there is no ongoing threat to the residents in this area. Anyone with information regarding this incident is asked to call the Ames Police Department at 515-239-5133 or the anonymous tip line 515-239-5533. You may also contact Crime Stoppers of Central Iowa at 515-223-1400. 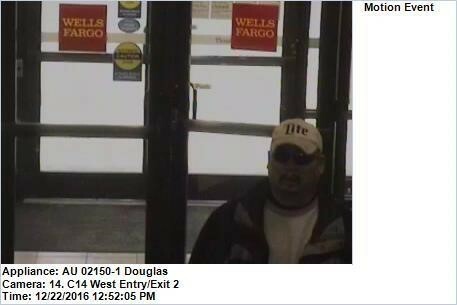 On 22 December 2016, at approximately 1:05 pm, the Wells Fargo Bank located at 4505 Douglas Avenue was robbed. Des Moines Police Department detectives are requesting the community’s assistance with identifying and locating the suspect. The suspect entered the bank and passed to the teller a note demanding money. The note stated that the suspect was armed, however no weapon was displayed. The teller complied and the suspect exited the bank. No injuries were reported during this robbery. 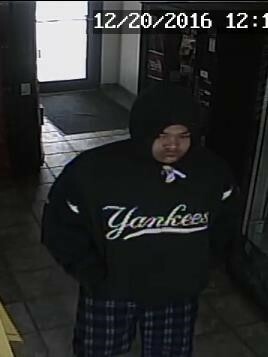 The suspect is described as a Hispanic male adult, approximately 6 feet tall, and weighing approximately 200 lbs. He had a mustache and goatee. At the time of the robbery he was wearing a Miller Lite ball cap, sunglasses, and a black / Gray jacket over a white sweatshirt. The teller also described the suspect as wearing a layer of makeup that appeared to be an attempt to lighten his complexion. 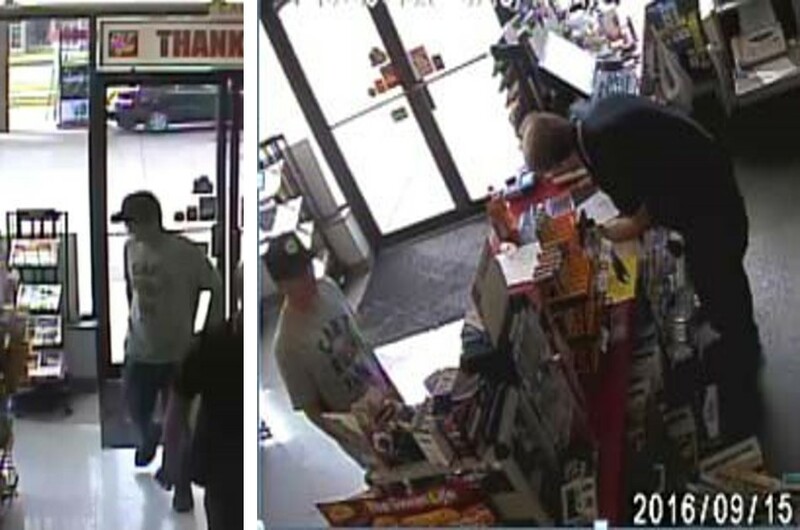 Attached are photographs from the robbery today. Anyone with any information regarding the identity and/or location of this suspect is asked to call the Des Moines Police Department at 515-223-1400, or Crime Stoppers of Central Iowa at 515-2231400. Des Moines Police Department detectives are requesting the community’s assistance with identifying an armed robbery suspect. On December 20th, 2016, at approximately 12:24 p.m., a suspect robbed the desk clerk at the Motel 6, 4817 Fleur Drive. The suspect was armed with a handgun during this robbery. The victim was not injured. Photographs of the suspect are attached. He is described as being approximately 5’8” tall. On 01 December 2016 at approximately 3:56 PM, the Financial Plus Credit Union at 2850 E Euclid Ave was robbed. Des Moines Police Detectives are requesting the community`s assistance with identifying and locating the suspect. The suspect is described as a white male adult, early 20`s, 5`5" - 5`8" tall and 120-175 lbs. The suspect was wearing a cast or Ace bandage on his left wrist. He passed a note to the clerk demanding money. No weapon was displayed. The suspect was last seen running northwest from the scene. Anyone with any information regarding this robbery and/or suspect is asked to call Det Peter Wilson at 515-237-1502, or Crime Stoppers of Central Iowa at 515-223-1400, or you may submit a tip online at www.crimestoppersofcentraliowa.com. On 01 December 2016 at approximately 10:45 a.m., the Bank of America at 501 E. Army Post Road was robbed. Des Moines Police Department detectives are requesting the community’s assistance with identifying and locating the suspect. The suspect is described as being a white male adult, age of late 20’s to early 30’s, approximately 5’10” – 6’00” tall and 180 – 200 lbs. The suspect was armed with a small handgun and passed a note to the clerk announcing the robbery. The suspect was last seen leaving the bank in a southwest direction (towards SE 5th Street). Anyone with any information regarding this robbery and/or suspect is asked to call Det. Matt Towers at 515-283-4981, or Crime Stoppers of Central Iowa at 515-223-1400, or you may submit a tip online at www.crimestoppersofcentraliowa.com. The Des Moines Police Department is requesting the community’s assistance. The persons in the photos are suspected of installing card skimming devices in ATM machines at Hy Vee grocery, 1107 E Army Post Road, and the EBank, 3401 SW 9th Street. Other area law enforcement agencies have similar investigations ongoing. Anyone with any information regarding the identity of the suspects in the photos is asked to call the Des Moines Police Department Investigations Division - Special Assignment Section at 515-283-4821, or Crime Stoppers of Central Iowa at 515-223-1400. The Des Moines and Urbandale Police Departments have identified a suspect in the murder of two police officers this morning. 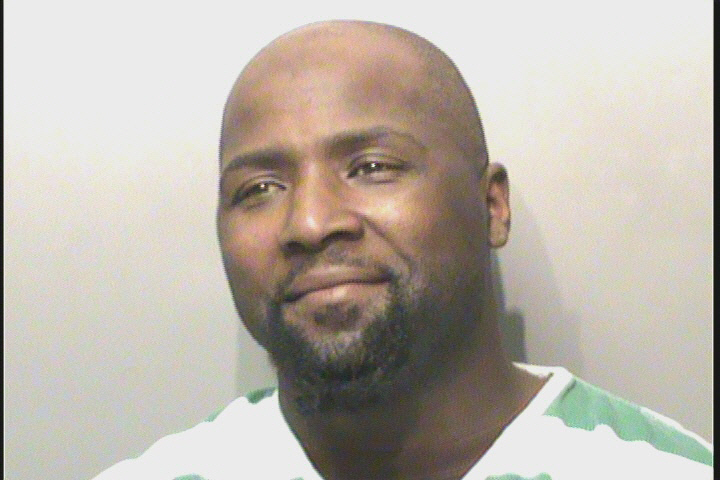 46 year old Urbandale resident Scott Michael Greene is being sought by investigators. Greene is 5’ 11” / 180 lbs with brown hair and green eyes. Greene was last known to be driving a blue 2011 Ford F-150 with Iowa license plate 780 YFR. The truck has a silver colored topper with a ladder rack. Greene is believed to be armed and should be considered dangerous. If seen, please do not approach Greene, but call 911 and report his location. 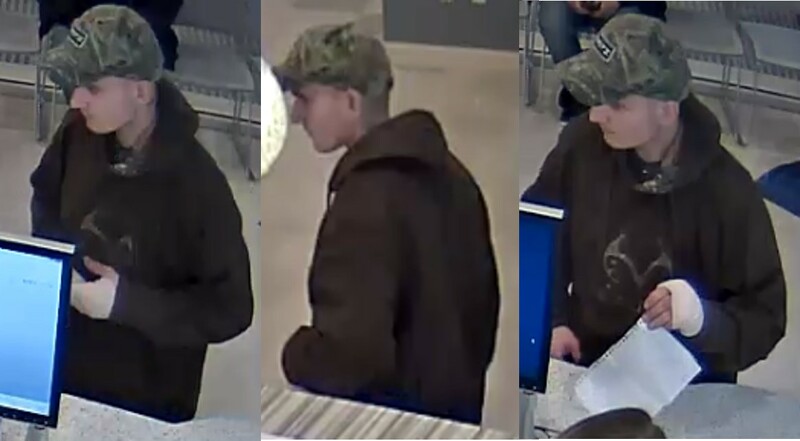 The Johnston Police Department is attempting to identify the person pictured in connection with a criminal investigation involving a company credit card that was stolen and then fraudulently used to make several unauthorized charges throughout Des Moines. According to the report #16-001148, on September 15th a ChildServe employee’s purse was stolen after forced entry was made into her vehicle while it was parked at the ChildServe care facility in Johnston. The suspect then used the employee’s ChildServe company credit card to make several fraudulent purchases at multiple merchant locations throughout Des Moines. A photo of a subject believed to be involved in the fraudulent charges was obtained from security video at one of the merchant locations where the card had been used. The subject in-question is a Caucasian male who was wearing a dark colored ball cap and a gray colored t-shirt with the phrase “CAN’T RUSH THIS” printed on the front. The subject is also believed to have been driving a gray colored extended cab pick-up. The Johnston Police Department is attempting to identify this subject so that he can be questioned regarding any possible knowledge or involvement he may have had in the described activity. Anyone who has information about the identity and/or whereabouts of the person depicted in these photos is urged to contact Johnston Police Detective Ryan Hanssen at 515-252-1364 or the Crime Stoppers of Central Iowa at 515-223-1400. Individuals providing information do not have to reveal their identity. All calls will be held in strict confidence and anonymity is guaranteed.